During this season of Advent, as we prepare for the celebration of God’s gift of love to our world, we wanted to share our own gifts with you, our faithful readers. Several of our regular writers were asked to share either one of their favorite Christmas books, or just a favorite children’s book that they love, and those will be posted during the next few weeks. These ‘bonus’ writings will not follow our normal review format, but we share them with you in hopes that you may discover a new book and learn to love it as our writers do! When I was first asked to share something about a new to me book the first book that came to mind was The Nativity illustrated by Julie Vivas. There was something magical that came over me the first time I read it, and each time I continue to read. As I thought about what I wanted to share with you about this book, I found myself continuing to come back to the illustrations. The text is the familiar story of Christ’s birth but is brought alive in a new way with the illustrations. The illustrations are simple and complex as it follows the story of the Nativity from scripture. Readers will need to pay close attention to the images in order to experience the joys, sorrows, excitement, and everydayness that come with pregnancy and birth. It is difficult to hear the same story year after year, but when paired with these images, the words sound fresh. I am planning a story and crafty night with elementary children during Advent and plan to use The Nativity alongside The First Night by B.G. Hennessy. The scriptures tell us the story of Christ’s birth, and then we get a few details of his early life, but much is left to the imagination. Hennessy begins with Christ’s birth and wonders aloud what it might have been like for Jesus, Mary, and Joseph. He pays attention and expands upon the details of the stable, the wind, the light and the animals. These are moments we often overlook as we seek to celebrate and learn about the birth and all who came to visit Jesus in those early moments. I love the way Hennessy brings out the ordinariness of this miraculous moment. It allows me to slow down and take in the miraculous. I love the way this text, paired with Vivas’ The Nativity, encourages wondering and imagination with such a familiar story. If you are looking for a book to add to your Christmas collection, be sure to check these books out. Elizabeth Boulware Landes, one of our Lectionary Links writers and the Director of Children’s Ministries at Faith Presbyterian Church in Aledo, TX, shares two of her favorite Christmas books. As you can tell, The Nativity is a favorite of several of our writers/reviewers. Follow the links in Elizabeth’s text to read other thoughts about this book, and then find The First Night which is one of the Storypath editor’s favorite Christmas books as well! 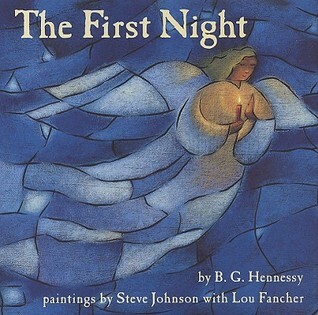 Advent Gifts: The First Night and The Nativity by Storypath is licensed under a Creative Commons Attribution-NonCommercial 4.0 International License.